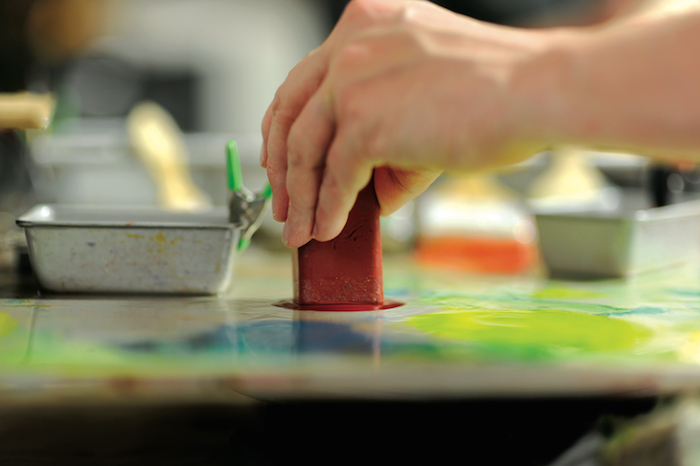 Encaustic painting is a unique medium all to itself, requiring specific tools, substrates, and brushes. Encaustic is from the Greek word Enkaustikos meaning "burn in", where the layers of paint are burned in or fused together with heat. Encaustic painting is one of the oldest painting traditions, founded by the Greeks as early as the second century and mostly known by the portrait work on Egyptian tombs, known as Fayum portraits for the region where they were discovered. Since encaustic is not effected by humidity changes or yellowing and it is painted primarily on wood panels, encaustic is extremely durable. Works can last centuries. Encaustic paints are made by melting and mixing beeswax with a touch of linseed oil and pigments, finely ground. The wax mixture is heated before and during use and fused onto a wooden panel so that the layers adhere to one another and the surface. 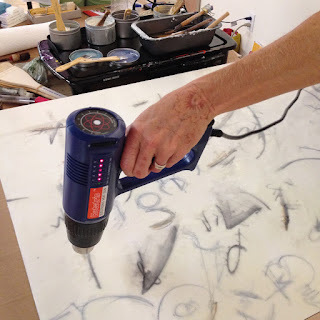 There are numerous ways to paint in encaustic as some artists work on a heated surface for blending and others paint with a heat tool in hand. Sometimes mineral spirits are added as a thinner for the paints, and artists often use soy wax to clean brushes. Thankfully, the list of resources on beginning in and working with encaustic is extensive, (see below). Most artists paint on a stiff substrate like wood with an absorbent gesso. Natural bristle brushes are usually sought for working in wax as they tolerate the high heat without melting and stand up to the weight of the wax paint. (Dynasty has a set dedicated to just Encaustic work.) However, synthetic technology is becoming more suitable in high temperatures, and testing is in process for more brush and tool options for encaustic work. Well-known encaustic instructors listed below; (this is by no means a complete list). Your local art supply store will know artists in your area. 2=1, oil on canvas, 24" x 48"
4+1, oil on canvas, 20" x 24"
Montreal painter, Pam Comeau is part of the newly open 10th Annual Healing Power of Art Exhibition for Manhattan Arts International, an organization started and run by Renee Phillips. "In different visual forms, styles and mediums, these artists create art as a catalyst to heal others, themselves, or to raise awareness and well-being in our society," explains Phillips. For several years, Dynasty Brush, Inc. has supported Manhattan Arts International as a sponsor for this particular exhibition. This year, Dynasty Brush chose Pam Comeau for her thoughtful work in the exploration of healing. Her painting takes healing to a whole new level as she explores emotional and spiritual healing through her work. Her art exhibits exquisite design and careful detail while bringing the viewer into the visceral world of the spiritual. Dynasty awards her thoughtful exploration of spiritual and emotional healing through her oil paintings. Comeau discovered Manhattan Arts International through an arts networking newsletter and found that the Healing Power of Art Exhibition qualifications perfectly described her All = 1 series-- how compassion heals emotional difficulties. Her entry, 6=1 caught my attention right away. Comeau's work visits emotional healing, setting her work apart. 6=1, oil on canvas, 27" x 45"
Mostly self-taught, Comeau creates figurative work with elements of animals, nature or objects for a metaphoric meaning. Her work is thoughtfully designed with a grisaille underpainting and meticulous layers of oil glazes. In using oils, Comeau enjoys the lengthy drying time for changes and additions. She uses mostly flats brushes, in a range of natural and synthetics, and only small rounds for detail work. Comeau found oil paint through a thoughtful gift, something that came at the right time and the gratitude has stayed with her. "I was very lucky because 22 years ago, when I first wanted to try oils, I was a single mom and money was a bit too tight to set myself up. One day I was painting a design on a piece of furniture with regular house paint when a neighbor passed by and saw what I was doing, the next day, he came over with a box full of supplies that had been sitting untouched in the closet. Brushes, canvas, a full box of oil paint and even an easel that the and his wife never used. The first painting, a still life, was for them. I will always be grateful," she shares. The Healing Power of Art online exhibition opened April 30, 2015 and will run through June 30, 2015. Currently, Comeau is spending her time in the studio creating a new body of work, but you can keep up with her exhibitions and see more in her gallery online. You can also read more about her in an interview with Manhattan Arts International. 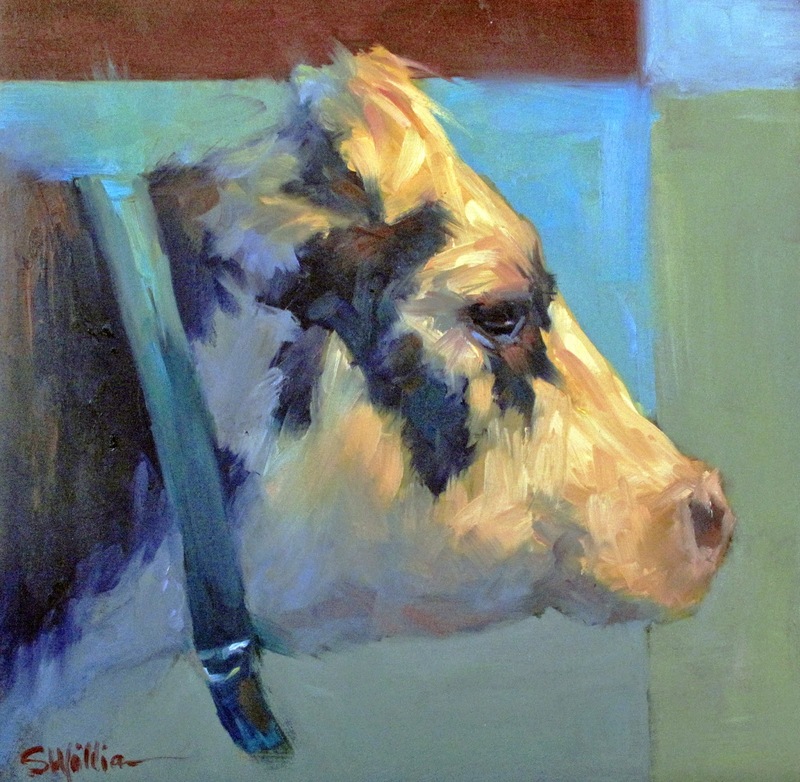 Susan Williamson has a passion for farm animals, getting to know them intimately through her painting. She shares that she had an awakening during an encounter with a bovine and has never looked back. "My goal is to depict these non-human animals as the sentient, beautiful beings that they are. That's it." 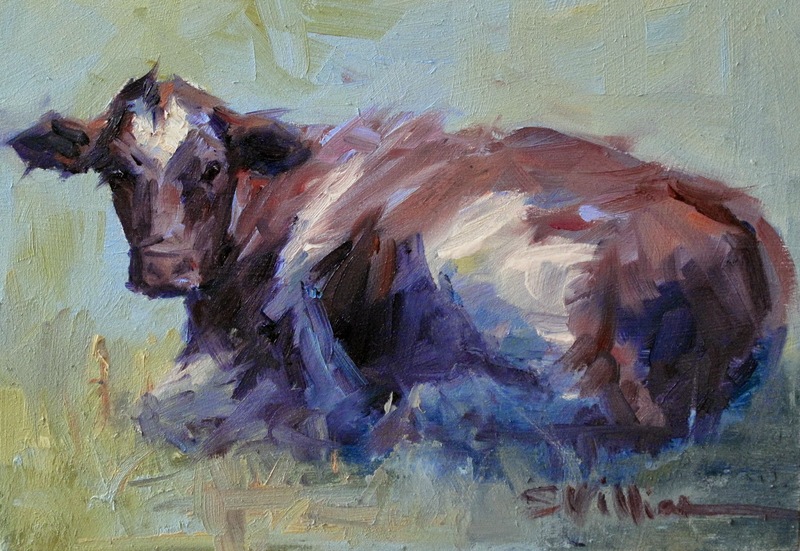 Susan mostly paints cows, but she says all farm animals have a place in her studio. She looks into their face, at their stance, or patterns in the coat and paints from her own photographs. Susan recalls a childhood full of drawing and painting, taking breaks for family and the corporate world. Once she left her full time job at an engineering company, she began her own education, taking classes with artists like master watercolorist, Jim McFarlane, and reading art books to enhance her knowledge. Early on, Susan explains that she chose her materials based on the instructor's materials list or articles in magazines. "In the beginning, I tried to save money and cheap out on materials which made the process more frustrating and gave me less satisfying results. Maybe it was a combination of poor quality materials and a learning curve, but most of the paintings were thrown in the trash. Using high quality materials is so much more satisfying. . . more pigment, more tooth, effective brushes all make a difference." 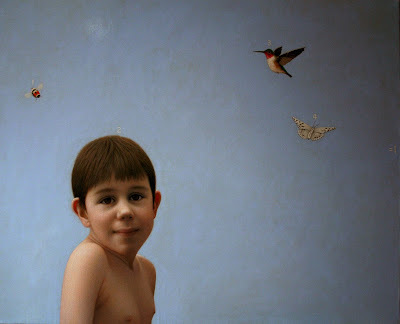 These days, Susan works in pastels or oils, depending on the subject and how detailed she would like the painting to be. In either medium, Susan relies on the best substrate, painting media and brushes. 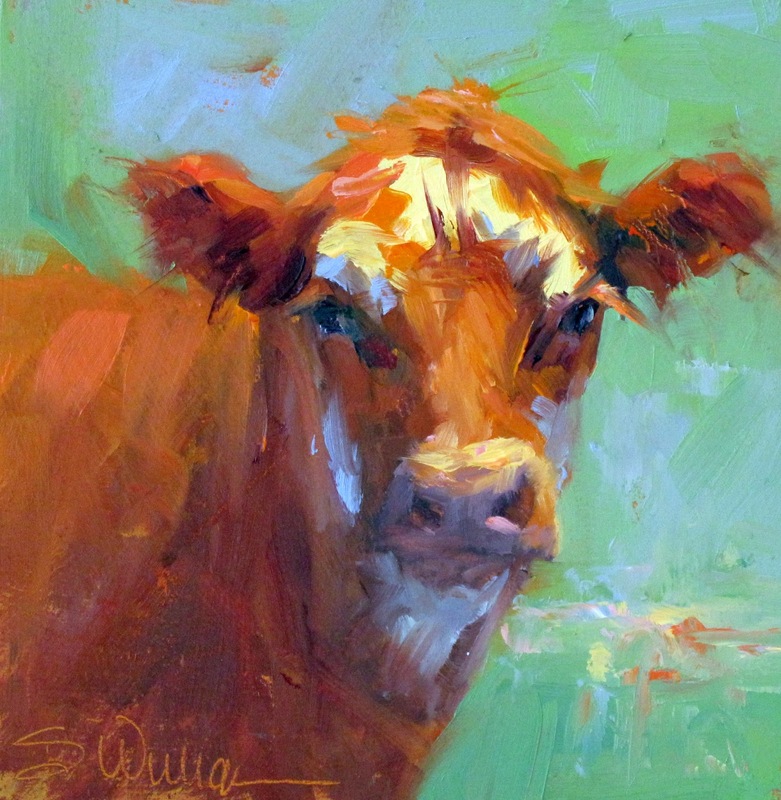 Her oil pieces are layered with beautifully rendered brush strokes, and Susan works with a range of brush sizes and shapes to achieve her technique.